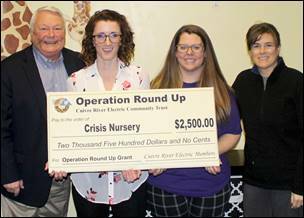 Members of the Cuivre River Electric Community Trust Board presented the Crisis Nursery with a check for $2500 from Operation Round Up. Operation Round Up helps address needs in the areas of health, education, home weatherization, youth, community and emergency services that cannot be met with other resources. More than $5 million has been awarded to applicants since the Operation Round Up program began in 1997. Grant funds come from Cuivre River Electric Cooperative members who voluntarily pay the round-up amount on their monthly electric bill.